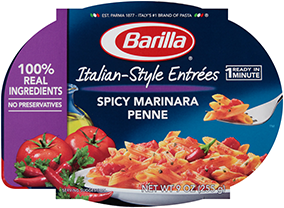 How is Barilla Tortellini different from other tortellini products? Barilla's shelf-stable Tortellini is a perfect balance between a thin, delicate layer of pasta and a flavorful, authentic Italian filling. The pasta complements the filling and does not overpower it. Barilla Tortellini is not chewy or doughy, and does not break or fall apart during cooking.